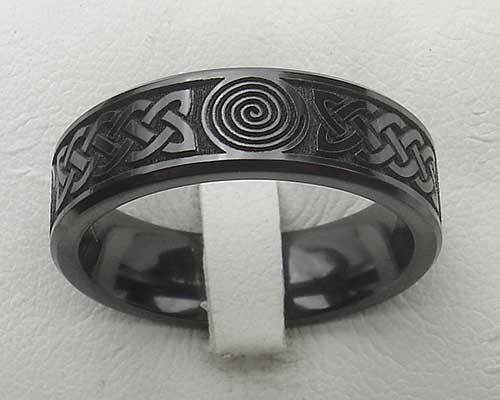 Men's Alternative Celtic Wedding Ring : LOVE2HAVE in the UK! This unique men's Celtic wedding ring has a real Gothic or alternative look to it and is something unlike anything else we have ever seen or even feature on our website. Being all over black and Celtic in design too, reminds ourselves of the Dark Ages of Britain, a time of mystery and legend and a ring to stir the imagination. The Celtic spiral symbol is believed to represent the sun which the Celts looked upon as a sign of not only death but rebirth also. Again, the never-ending cycle of life portrayed in our jewellery. As pictured the symbol is a Celtic spiral in a circle designed into a very modern styling. This symbol is engraved four times around the ring at quarter amounts. Sitting between the spirals are Celtic weave patterns that are very tight in design style - something that only a laser engraving technique can achieve. We love this ring for its detailed Celtic design, and it sits superbly on the surface. The profile is flat, and it features a slightly bevelled edge to the design. The designer has advised us that the engraving for this ring takes an hour to complete. The engraved surface itself is quite textured, therefore adding to the ancient Celtic symbolism depicted. The ring's width is 7mm, and it is available in a satin or polished finish.